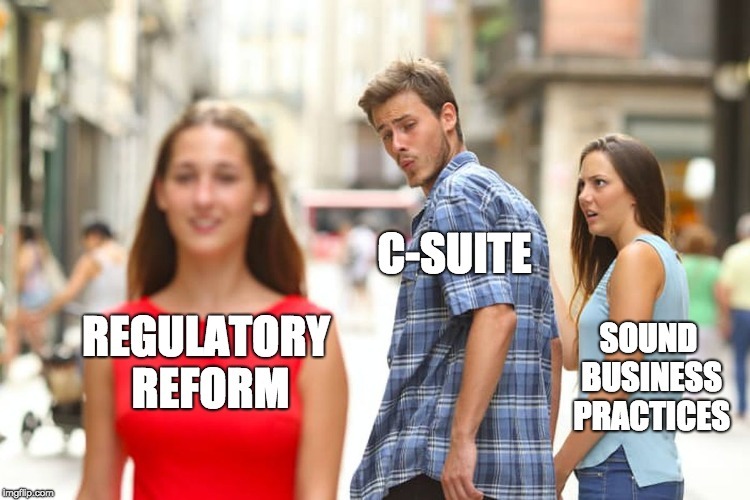 Fresh news on the regulatory compliance front: banking regulators published a bulletin on Tuesday clarifying the role of the supervisory guidance they issue, to remind everyone that violating points raised in guidance documents is not an automatic compliance failure unto itself. This is in step with the Trump Administration’s larger effort to defang “sub-regulatory guidance” — the speeches, policy statements, and other pronouncements that agencies often issue, but which are not formal rules that go through the standard proposal and public comment process required by law. Now the banking regulators are following suit. The Federal Reserve, Federal Deposit Insurance Corp., National Credit Union Administration, Office of the Comptroller of the Currency, and Consumer Financial Protection Bureau all signed on to Tuesday’s statement. “Supervisory guidance does not have the force and effect of law, and the agencies do not take enforcement actions based on supervisory guidance,” they said. Yes, that guidance “often provides examples of practices that the agencies generally consider consistent with safety-and-soundness standards or other applicable laws and regulations,” but the examples are still only examples, not holy writ that must always be followed. Examiners will not criticize a supervised financial institution for a “violation” of supervisory guidance. Rather, any citations will be for violations of law, regulation, or non-compliance with enforcement orders or other enforceable conditions. During examinations and other supervisory activities, examiners may identify unsafe or unsound practices or other deficiencies in risk management, including compliance risk management, or other areas that do not constitute violations of law or regulation. Excellent use of air-quotes around “violation” to undermine the valid question of whether you’re doing something “dumb” by ignoring whatever ideal practice the regulators are “recommending” in their sub-regulatory guidance. Abusive enforcement aside, agencies do issue sub-regulatory guidance for a reason. If your firm departs from it, you may still want to ask whether that’s a “good” idea. Examiners will not criticize a supervised financial institution for a “violation” of supervisory guidance. The rest of the document hits all the usual notes you’d expect from regulators in the Trump Administration. The agencies intend to limit the use of numerical thresholds or other bright-lines tests in describing expectations in supervisory guidance. They will try to refrain from issuing multiple pieces of guidance on the same topic. From time to time they may even ask for public comment on supervisory guidance. We could get meta here, and note that this guidance saying sub-regulatory guidance needn’t always be followed is itself sub-regulatory guidance. Your outside counsel will be charging you $700 an hour to raise that point in a footnote. We also have a new report from the Brookings Institution that examines the pace and nature of rulemaking at the Trump Administration since President Trump issued his executive order in 2o17, promising that for every new regulation proposed, two others would be slated for repeal. Don’t die of surprise, but that deregulatory frenzy hasn’t come to pass. Instead, Brookings found lots of inaction — hardly any costly new rules adopted (yay! ), but hardly any costly old rules repealed, either (boo). Brookings tracked 39 “major” rules adopted in the first 18 months of the Trump Administration, and found only one that imposed significant costs on the affected industry: new Energy Department standards for walk-in freezers, which the industry generally supported anyway. President Trump, overstating regulatory rollback at event in December. Brookings also counted only 66 deregulatory efforts in all of 2017, and 22 of them actually began during the Obama Administration. Another six were enacted because Congress revoked the original rule using its powers under the Congressional Review Act. The volume of deregulatory activity did vary depending on the agency, with the Environmental Protection Agency, the Labor Department, and the Health & Human Services Department leading the way. And the pace of deregulatory activity may accelerate this year and beyond as Trump bureaucrats finally figure out how to make the mechanics of government actually work. Still, the overall story of Trump’s supposed deregulation push holds true: that it isn’t true. 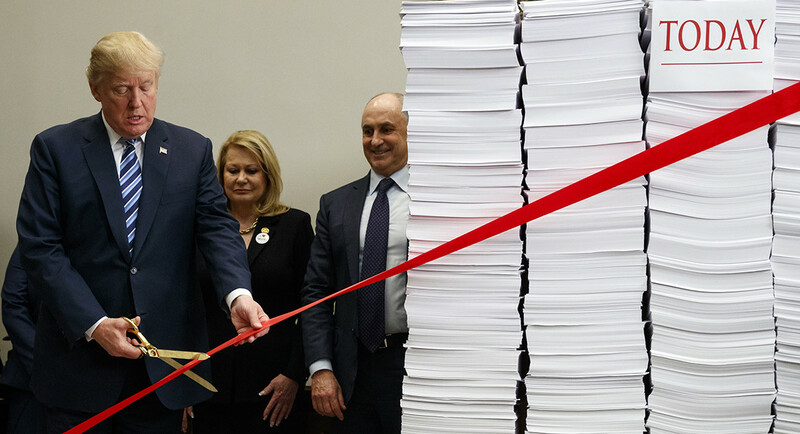 At best the Trump Administration has slowed the growth of new regulation, but Trump’s talk about sweeping regulatory rollbacks is just another example of his fact-free blather. After all, remember all the loopholes in Trump’s 2-for-1 regulatory kill order. Independent agencies such as the Securities and Exchange Commission, Federal Reserve, Public Company Accounting Oversight Board, OSHA, Federal Trade Commission, and many more (read the complete list if you like) are exempt. New regulations relevant to military, national security, or foreign policy are exempt. New regulations required by statute are exempt. And agencies only need to propose repealing two rules, not actually repeal them. Those proposed repeals must go through the usual public comment and review process — which, as every compliance officer knows, can take forever. So yes, the administration can (and does) take credit for withdrawing or delaying planned rules. But that is not the same as repealing existing rules, and existing rules are what fills a compliance officer’s time.